I remember back when George H.W. Bush was making a run for the White House. My late husband, Max Starkloff, and I talked about the two candidates. Michael Dukakis, 65th Governor of Massachusetts, was running on the Democratic ticket against George H.W. Bush. Both Max and I are liberal Democrats. But for that particular election, I voted for George Bush! 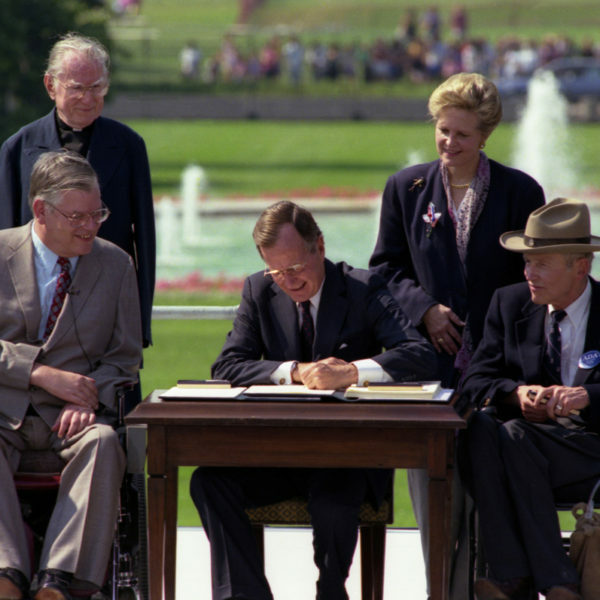 I had no idea that he would later sign the Americans with Disabilities Act (ADA) into law in July 26, 1990! I voted for him because I thought he sincerely had the interest of the country at heart. I didn’t agree with him on all issues, but I really thought he was just a good man. As it turned out, my instincts were correct. Not only did he sign the ADA into law, but one of his chief advisors, Boyden Gray, was very helpful to disability rights advocates who had a close connection to him (think Evan Kemp and Justin Dart…for starters) and was updating the President on our efforts to bring the ADA before the entire Congress. So the President was ready to sign when the law finally got through the Congress. There was a big party on the White House lawn after the signing. Many of our friends from the Disability Rights Movement where there. I do not recall why Max and I did not attend the Signing Ceremony and the party, but we did send staff from our organization for the momentous occasion. “Let the shameful wall of exclusion finally come tumbling down,” Bush said when he signed the law in 1990. He also urged businesses to take advantage of “untapped human potential” by hiring those with disabilities. The disability rights community has been calling for employment of all people with disabilities since I got involved in this Movement in 1973. However, we did not have all the pieces in place that would enable us to enter the workforce then. The passage of the ADA, with its sweeping requirements for accessibility in Title 2: State and Local Governments; Title 3: Public Accommodations; Title 4: Telecommunications (for deaf/hard of hearing people); and Title 5: Miscellaneous (over the road rail and buses) was incredible! And Title 1 of the ADA called for an end to discrimination against people in employment practices and the workplace. The ADA laid the groundwork for the disability community to finally have the opportunity to enter the workforce. We now have curb cuts, access to public transportation (to enable getting to work), access to workforce locations, protections from workplace discrimination, access to communities at large, and so much more that we did NOT have before the ADA was passed. Couple that with Diversity and Inclusion efforts by most major companies in the U.S., and the enforcement of Section 503 of the Rehabilitation Act of 1973, (requiring federal contractors to ensure that 7% of their workforce is inclusive of employees with disabilities), and we have the best opportunity see a greater influx of disabled workers than we have ever had. I am sorry that we have lost a man…a President…a world leader, who did not see disability rights as a partisan issue. Rather, he saw it as a civil rights issue. He saw equality for disabled people as just…as part of what this nation was founded upon, and still stands for. Today, the world is a better place for ALL of us because of President George H.W. Bush. I guess I voted right that day! Thank you, President Bush! Rest in Peace.